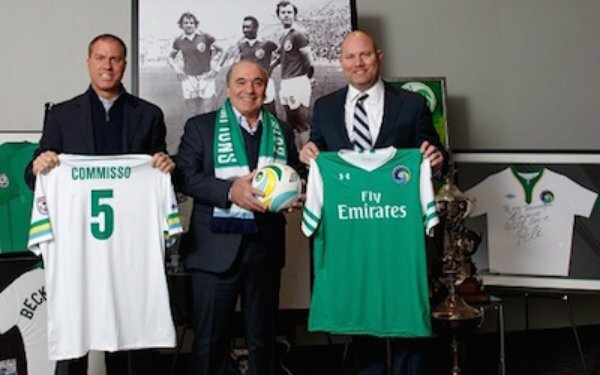 Two days after the NASL announced it will not play in 2018, Rocco Commisso, the chairman of the league's board of governors and owner of the New York Cosmos, held a conference call with the media. Commisso, the founder, CEO and chairman of cable giant Mediacom, talked about his plans for the Cosmos and the litigation he has pursued against U.S. Soccer in U.S. District Court and its board of directors in a civil suit filed in New York state court, what he thought about new U.S. Soccer president Carlos Cordeiro and his predecessor, Sunil Gulati, and how the media should uncover the "skeletons" he says are in American soccer. About 40 minutes into the call, he asked a questioner, soccer writer and author Beau Dure, to repeat his name, and said, "Oh, you are the one that writes all those stupid things out there I read on Twitter?" Commisso, whose attorney was in the room as he talked, earlier said he wasn't allowed to talk about settlement talks that took place but later stated, after dismissing Dure's idea of the NASL going ahead with its teams in a new league, "I already made the statement that back in October, the USSF, they wanted to do the right thing, in front of the courthouse, OK, before ..."
At that point, the line from Commisso was cut off. "Is it just me now?" asked Dure after a few seconds of silence. The AT&T operator confirmed the line was lost. Four minutes later, Commisso apologized that the call was down, and the conference call continued. Short-term plans for the Cosmos. "I do not have definitive plans except for what we will do the next three months. We will continue the academy, which has about 60 people. We're going to have the NPSL [Cosmos B] to be played probably at Mitchell Field, maybe some games at Columbia in Manhattan. Beyond that, I have not defined a plan within my own head about what's going to happen to the Cosmos next year." Plans to continue litigation or pursue settlement discussions. "We're full ahead litigating this. That's with certainty. Not just this but all the other stuff that's been filed. The last time I checked there were six or seven things been filed by us or other people [USOC complaint filed by Hope Solo, suit by U.S. youth clubs for solidarity payments in FIFA's Dispute Resolution Chamber and complaint by the NASL's Miami FC and NPSL's Kingston Stockade FC in the Court of Arbitration for Sport, seeking promotion and relegation be adopted across all U.S. divisions]. For sure, we are going to continue. In terms of settlement discussions, it takes two to tango. They know where they stand. They know they tried to have confidential settlement discussions, but I am not allowed by my lawyer to talk about what happened there. I will leave it at that. But we were very unhappy. I was told not to say any more. This could have been fixed. This could have been avoided." Has the NASL heard anything from U.S. Soccer since it announced it would not play in 2018? "We got a letter, a stupid letter, let me call it that, a snarky letter, let me call it that. A letter I don't think I'd even take to the bathroom in case I run out of paper. You follow me? Nothing from [Carlos] Cordeiro. No calls. Zero from Cordeiro. He's the new chief, I heard, right? Didn't he say he was there for the soccer family? What are we? Adopted children? What kind of children are we if he cares about the family? It's his job to come to me and acknowledge the mistakes that have been made here. It's his job to come to me and say, 'Rocco, maybe there's a different way to fix this thing up? It's not mine.'" Was he willing to approach Cordeiro? "Why should I approach Cordeiro myself? Who the hell is Cordeiro any way? First of all, I am a little older than him. In my country, older people get respected. Two, I know 10,000 [times] more soccer. Three, I still have a job, he doesn't. Four, he should come talk to me the way he does everyone else. He did a good job talking with the Athletes Council to make sure those votes went to him." How U.S. Soccer operates. "'You take care of me, I'll take care of you, as long as it's within our own family because we are in charge of soccer. We are the ones that everybody has to go through if you want to play a part of soccer.' I find that to be demeaning, I find that to be absolutely disgraceful, I find that to be the No. 1 reason why our country has failed miserably." What he would like to see from U.S. Soccer. "The USSF, for this to be fixed, has to become an independent, regulatory agency, period. End of story. The SUM deal should not exist, and the favoritism they've always had towards MLS should stop. Its other leagues have to be dealt with and taken care of the way MLS was favored from the get-go in the early years if soccer is to succeed in this country." The men's national team's record. "Winning six games in 85 years in World Cup competition is nothing to brag about. We are a failed soccer nation, we were then and we still are." The USL to which many NASL players have moved. "We are subsidizing players as we speak to go and play in this league called the USL, where the average payroll is $400,000. I had one player making $400,000. Do you know what the disruption in player's potential competitive salaries is taking place as a result of this decision. Do you know that a lot of people work on a part-time basis? Do you that a lot of people when they play they are paid by the hour?" The World Cup 2026 bid. "Surely, given how Gulati performed his job in the last year, as far as I am concerned, he should not be the person leading the charge. We have not heard the new president [Cordeiro] make any statements. I know he is on the [United 2026 bid] committee. With the infrastructure we have, the significantly better infrastructure we have in the U.S., we should win it with our eyes closed." 9 comments about "Cosmos owner Rocco Commisso has his day with the media". Bob Ashpole, March 1, 2018 at 11:43 p.m.
John Polis, March 2, 2018 at 12:15 a.m.
Back years ago when I was covering the NASL, the league had its share of blowhards. Decades later, this, apparently, is one more. R2 Dad, March 2, 2018 at 1:30 a.m.
Obviously the guy is short on social graces, but what about the substance of his arguments? All I’ve heard so far is , “if he’d paid MLS $100M a few years back he would have been the second NYC team and we wouldn’t have to mention this schlub ever again”. Bob Ashpole replied, March 2, 2018 at 2:50 a.m. It would be interesting if he revealed his business plan for the Cosmos. R2 Dad replied, March 2, 2018 at 1:35 p.m.
Only Cordeiro can change this, but he wasn't chosen for that kind of "hope and change". John Soares, March 2, 2018 at 5:24 a.m. I play by MY rules...If you don't want to play by MY rules you are a know nothing idiot. Unfortunatel he still gets press. Perhaps that too will end soon!? Wooden Ships, March 2, 2018 at 8:28 a.m. He might have a difficult personality, so what. I agree with a number of his comments. USSF has been a closed system and much has been entrusted to them, for a long time. Aside, from more playing soccer, which was inevitable, has there been a lot of improvement with outreach and access? Bob Ashpole replied, March 2, 2018 at 10:37 a.m. I actually think that USSF's "closed" (I prefer insular) nature has worsened over the last 15 years or so, not improved, but I don't fault how they administer its professional member organizations. I think many fans most often criticize USSF for not imposing "promotion and relegation" between member organizations. That is simply unrealistic. When a league expands in a geographic area beyond the number of teams practical for a competition, they breakdown the clubs into divisions typically determined by competition results. That is how promotion and relegation within a league is adopted by leagues. In a huge geographic area, it makes more business sense to form conferences based on location rather than inferior divisions within a league. Francisco Marcos, March 2, 2018 at 11:58 a.m. I applaud Rocco for the millions he has spent , in this case, wasted , on soccer... unfortunately , like so many other Johnny-come-late types he did not bother to really study the entre situation of how “this “ NASL, (and let’s not confuse the two),came to be... had he done that homework he would have stayed away like the plague...this is however, a recurring problem in the history of Pro American soccer....no due diligence. He would have found out, for example, that the people responsible for the rebirth of this NASL,would end up a few years later in the Brooklyn Federal Courthhouse.